These pictures are of Tifgreen 328 Hybrid Bermuda sod at Old Ranch Country Club in Seal Beach, CA. Both were taken 10 days or so after being installed by Golf Course Superintendent, Don Parsons. 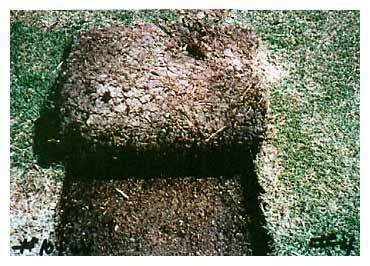 Please note root development difference. Don has sodded around 75 acres of Old Ranch---including landing areas of all 18 holes---with P4. He also built a Purrwick Green---sand, P4 and rice hulls. Next time, he says, the organic materials will not be included. After this comparison, Don feels P4 is a must. 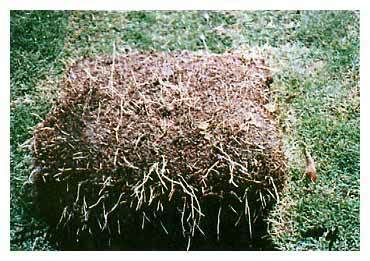 The turf establishes itself immediately so is playable sooner, withstanding heavy traffic and is "beautiful". To Don, the water saving is incidental compared to P4's other effects, but he knows he has several days' grace period in the event of irrigation problems. Don's "recipe" calls for 15 lbs. P4 per 1,000 sq. ft. with 6-20-20 fertilizer broadcast with a rotary-type spreader on the top of the soil beneath the Tifgreen 328 sod.